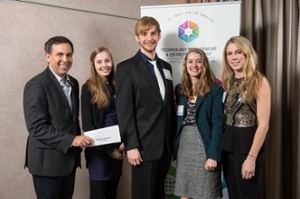 2015 was another record setting year for the J. Herbert Smith Centre for Technology Management & Entrepreneurship’s (TME) Student Pitch Competition. 33 teams registered, with over 60 students participating, and 100 people attended the awards dinner where over $8,000 in prizes was awarded. First place in the ideas category went to Reverse Vending Recycling Systems, pitched by third year mechanical engineering student Vuk Stajic. This company proposes installing reverse vending machines in residences and student housing complexes across the country. These machines would be tied into the schools database and automatically apply credit to students’ accounts when they insert refundable recycling items. The credit could be split in any way desired between the student, their residence, or any charity or organization agreed upon by those in the complex. First place in the growth category went to Tempo, which is a motivational workout app that syncs the individuals’ music to their heart rate. The app was pitched by Nicole Bendrich, and supported by her teammates Katie Wilson, Ryan MacDonald, and Sophie Daigle -- all electrical & computer engineering and TME students. This year’s sponsors included Cox & Palmer, NBIF, FCNB, The Pond-Deshpande Centre at UNB, International Business and Entrepreneurship Centre in UNB (Fredericton)’s faculty of business, Stantec, Innovatia, Mariner Partners, J.D. Irving, Smart Skin Technologies, and UNB’s Engineering Endowment Fund.